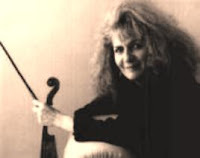 Iona Brown (Elizabeth Iona Brown) was an English violinist and conductor born on January 7, 1941 (Heifetz was 40 years old and would live another 46 years.) Her early studies were in London with Hugh Maguire. She later studied with Henryk Szeryng as well. From 1963 to 1966, Brown was a member of the Philharmonia Orchestra and played in the Cremona String Quartet. In 1964, she joined the Academy of St. Martin in the Fields, and became a soloist and director in 1974. There are many recordings of her playing with this orchestra. She left the Academy in 1980. In 1981, Brown was appointed artistic director of the Norwegian Chamber Orchestra. She also served as music director of the Los Angeles Chamber Orchestra from 1987 to 1992. In 1998, Brown gave up the violin entirely (due to problems with arthritis) and dedicated herself to conducting. She died on June 5, 2004 at age 63.